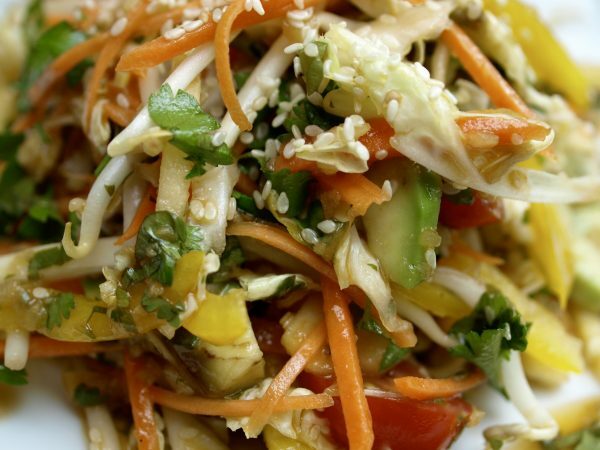 Healthy Zesty Power Salad - (vegetarian and vegan) Boost your heath levels with a power salad, packed full of nutrition and dressed in an exciting Asian inspired sauce. One portion of this and you easily get at least 2 of your 5 a day. Dressing - 1 x shallot – very finely diced or grated 1 cm fresh ginger – grated 1/2 clove garlic – crushed 1 tablespoon coriander leaf - chopped 1 heaped teaspoon tomato puree 2 tablespoons rapeseed oil (or sunflower) 1/2 teaspoon sesame oil 1 tablespoon rice wine vinegar (or try white wine) 1 tablespoon light soya sauce (or Tamari for Vegans) 1 tablespoon cold water 1/2 lime juice - Add all the ingredients to a clean jar and shake until well mixed, this dressing will last in the fridge for several days. Topping – Choose one or all - 2 teaspoons sesame seeds – toasted or plain 1 tablespoon coriander leaf – chopped 1 tablespoon roasted peanuts or cashews - crushed - Top your salad with a sprinkling of the above. Carrots - full of carotene an antioxidant. Cabbage – A good source of calcium. Peppers – High in B vitamins. Avocado – Contains healthy fats which can help lower cholesterol. Tomatoes – Offer lycopene a cancer preventative. Beanshoots – Give us A, B and C as well as being easily digested. Watercress – Contain carotenoids which protect age related problems.